1. Sorry I didn't fluff and fix the pillows on the sofa. (The OCD in me feels bad for that.) It's usually much fluffier and cuter. 2. Pardon the lighting, that's one of the biggest issues I have in here. Not enough natural light. 3. I tried my hardest not to "fix" anything and just let you see The Sweet Spot in all its natural glory. No judging (even though I'm still in my pajamas)! 4. Yes! That's a speeding ticket on my board above my desk. It was hubby (promise). 5. That beast next to my monitor is my new baby. My Canon printer that I was (very excitedly) able to gift myself after all my sales last month. Woot, Woot! Okay, that should set you up for hearing my voice for the first time (eww). And, I'd love to hear what you think of my studio and give me tips on what I could do with that un-"inspiration" board! Sweet Spot Studio from Leesandra Diaz on Vimeo. A quick peek into my home studio. And, as you may have noticed I have a card on my desk. It's a custom order card from a mom to her daughter who just got her first job and is working in Sydney. I remember when I got my first job in Manhattan working at a law firm across the street from Grand Central Station. I thought I was "it". I bought anything I wanted and shoes were on the top of that list. Hope she loves her card. I do! There's another card that's part of this order and I will share once I have a moment to snap some pics of it. This card was cut with my digital cutter. And, you MAY think that means it's way easier. Well, it's NOT! Took me a few hours to cut each piece out just perfectly and then assemble the card without any glue disasters. 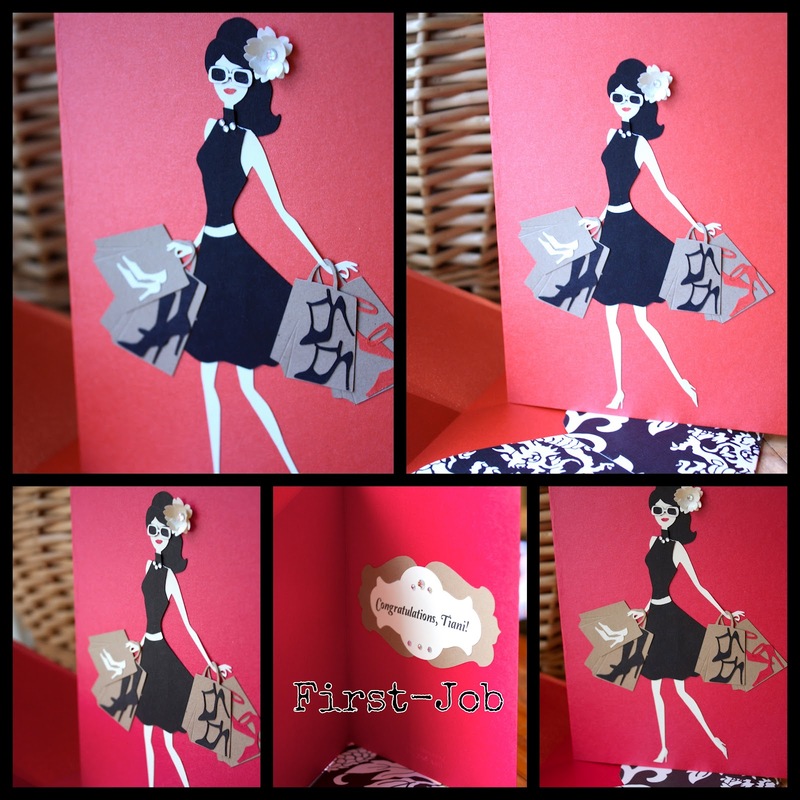 I also created the card and envelope (plus liner) from scratch. If you notice, the bags even have indentations like folds as does her hair. That was all done by hand. And the bling, well, you know bling is tiny and has to be placed perfectly. So, even though I didn't create the file I used, I certainly created the card and it's still very much handmade and personal. Of course, much respect to those who even do the cutting by hand (bowing in humble admiration). I hope you enjoyed my post and I also hope you have a fabulous Wednesday full of SWEETNESS! Awesome studio, looks very organized, except the paper strips,lol, well atleast there all in one spot. Also love the cute card, thanks for sharing!!! Thanks, Paula! The paper strips win. I can't conquer them! Guys her whole house is ORGANIZED!!!!!!!!!!! That IS her. It looks great and I LOVE the card, who doesn't want to buy tons of shoes right? Very cute.